Even earlier is better, since it takes time to build up understanding and work on vocabulary. If you’re starting a little late, though, don’t panic! You can still use the time you have left wisely. Listening is the second section on the TOEFL that you get to work on right after Reading. The TOEFL Listening tasks consist of short-to-medium-length audio clips from lectures, academic talks and more casual conversations and dialogues. The section can be from 60 to 90 minutes long and have 34 to 51 questions. It is a very intensive part of the test, and many people find it the most difficult. Listening can definitely be challenging: Understanding spoken language requires getting used to tone and speed of speech. There might even be slang used. Also, most audio clips are played only once. This means there is no second opportunity to catch content, like during the Reading or Writing sections. Having a good working vocabulary is also needed to do well at TOEFL Listening. The good news is that listening practice can be fun. It doesn’t have to be serious or academic all the time, and it doesn’t have to be stressful. You can incorporate TOEFL Listening practice into your everyday activities and even hobbies! In this post, we’ll look at some great listening resources you can use to prepare yourself for test day. But before you start listening, let’s look at the basic skills you should focus on. The ability to understand what is being said or discussed. Knowledge of single words and phrases (good vocabulary). The ability to grasp general meaning quickly without getting stuck on parts you don’t understand. Keeping up with different accents (American, British, Australian, New Zealand). Knowing how to take effective notes (since most Listening tasks play out dialogues only once). Before you start having fun with practicing listening, you need to do some formal studying, either by yourself or in a study group. To do well on the test, you will need to know the specific format of tasks and get used to doing them. Make use of the official sample questions and dialogues to study the types of questions that get asked on the TOEFL. Also work on expanding your vocabulary, especially vocabulary used in casual conversations about university life. Be sure to test yourself on it. Remember that the TOEFL focuses on lecture excerpts, political or scientific discussions and formal dialogues. So the best way to practice is to listen to lecture recordings, talks and podcasts. There are some great resources to help you with this below. Once you are familiar with how TOEFL Listening works, you can add some more fun ways to practice it! While there are lots of things you can do to improve your listening skills in general (like watching movies in English, listening to English music and talking to native speakers), to do well on the TOEFL you need to improve your test-specific knowledge. However, this doesn’t mean all your studying has to be dull and formal. Radio is a great alternative to formal studying. It can provide the challenge of listening to audio on specific topics while also being fun and interesting. One big advantage of radio is its wide availability from different countries, which gives you a great tool for working on your understanding of various accents. Video can also provide motivation. Video can keep your attention even if you don’t feel like practicing listening. Even more formal lectures and talks can be more fun with visuals involved. Here are some resources to get you started with all kinds of listening that will help you on the TOEFL. This study guide provides you with more sample exercises (in addition to those you will find on the ETS official website). On this page, you can get a good idea of how the listening part of the TOEFL usually goes. Working through these exercises will help you understand where you need to focus in your listening preparation. For example, you may need to work on overall comprehension, better note-taking or paying more attention to details. This is an enormous catalog of online courses, lectures and talks. Some of the links are videos, but most of them are audio files. You can choose from any academic subject that interests you and get access to hours of lecture material. There are lectures from prestigious universities like Harvard, UC Berkeley, MIT and many more. This site will give you exposure to the real-life classroom setting and prepare you for TOEFL tasks that feature real people speaking. Stanford University on iTunes can be very helpful if you don’t feel like digging through lots of links for courses. You can go straight to this collection of lectures from one of the best universities in the world! Stanford offers so many lectures and talks from its top faculty, it’s enough to pass a hundred TOEFLs! All courses are free and get updated regularly. Wiki TOEFL is your best bet for handpicked English videos from all over the internet. Whether you’re looking for an educational clip, news, an inspiring talk or some conversation, you’ll find it here! With Wiki-TOEFL, you can listen to a variety of topics and get used to a variety of accents. Interactive captions make it easy to pause and explore words you don’t know, which means you can work on your listening skills and build your vocabulary at the same time. The short videos are great for trying to grasp an overall idea—a very necessary skill for the TOEFL! Wiki-TOEFL is suitable for all English levels and is available right on the website. Students of all levels of English decide to take TOEFL. Not every test-taker is an advanced speaker. ManyThings caters to students at the beginner to intermediate levels by providing audio clips on various topics along with transcriptions. You can listen to the clip while following along with the transcription. Or you can listen first and check your understanding afterwards. This is a great resource for TOEFL listening practice directed at students with a lower intermediate level of English. This website has tons of radio stations for you to choose and stream online. You can find a podcast or a radio program based on your hobbies and interests. Browse different categories or pick a radio genre: You’ll find comedy, sports, news, talk and even college radio. The stations are mostly USA-based, so they are useful for American English practice and understanding of slang. The BBC is a great tool for mastering your understanding of proper British English. The BBC makes its radio available to listeners worldwide (as opposed to its television programming, which is only accessible to viewers with UK IP addresses). This is a high-quality public radio station for news and discussions of current affairs. Tune in and get listening to British accents! If you feel like being entertained, BBC Radio 4 is a great resource for drama, comedy and educational programs. Listening to any of them will help you with overall understanding, catching the general meaning of dialogues and building your vocabulary—especially if you choose to listen to one of their educational shows. Try taking notes and seeing how effective they are for remembering the contents of the program. TED Talks are lectures on a wide variety of engaging and sometimes bizarre topics, delivered by professionals and enthusiasts in their fields. TED Talks are available in both audio and video formats. They are useful for TOEFL practice because you can really narrow your search down to a specific area. Pick a language (that would be English, of course). Pick a topic. Pick a short talk, if you only have twenty minutes to spare, or pick an hour-long lecture. You can even pick a speaker! TED Talks are as close as it gets to listening to a lecture in a non-academic setting. 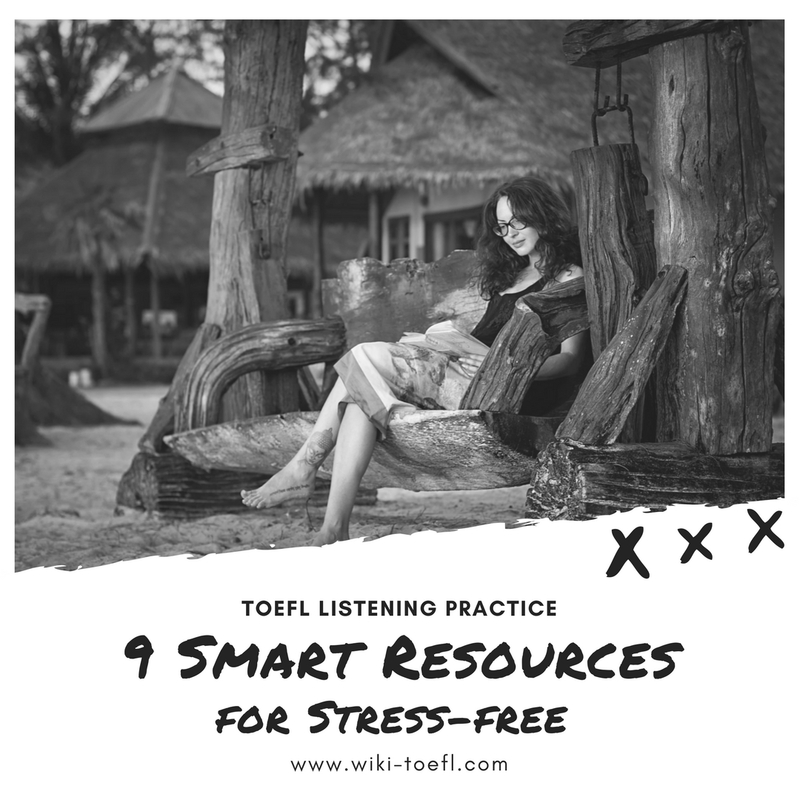 Now that you have these resources to make your TOEFL Listening practice not only effective, but also fun, it is time to begin studying! Remember that good listening skills do not appear overnight. It is very important to give yourself enough time to build them up. Have patience with yourself, go at a steady pace…and keep listening!